Once you've put the fins and straps on and picked the board up, the first thing you notice is how light it is for a board of this size. The board has a fine shiny finish, and very good quality pads and straps. When flexed from tip to tip, there is a good amount of flex, but the central section is stiff and can only be flexed by a small amount. The rails are thin and square at the tips, but thicken somewhat toward the middle and are a little more rounded. The fins are fairly small but are aided by the moulded in central fin to give some extra grip, and there are moulded corrugated areas on the edges and tips to assist with grabs and board-offs. The board has a medium amount of rocker and no concaves, but instead has a very slight V shaped underside, which you can only notice by placing a straight edge across the board. 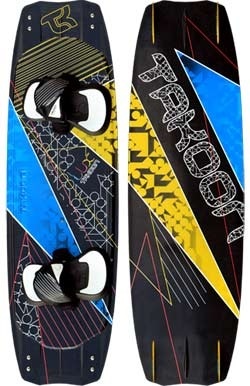 I tested the board in fairly light wind conditions and it seemed to plane early and with good speed. The Lux points very nicely upwind, and the fins bite well into the water, giving a very stable ride. The flex of the board seemed to work very nicely when riding over the small chop present on the day, and was definitely a board with which I became comfortable in a very short period of time. The board takes a little bit of commitment to slide from heelside to toeside when riding along normally, but it slides around effortlessly when flattened off for downwind surface passes. When loaded up and popped, the board really whips you into the air very nicely, and I can't wait to take it out in some stronger wind conditions. One thing I've also been very much looking forward to doing with the Lux is riding it finless, so I removed both fins off one end, in order to compare riding one way to the other. Without the fins the board does squirm around a little but its reasonably controllable and the reduction in drag is quite noticeable. This would be a very good option nailing some kickers and sliders, or trying nose-slides, but it would be nice if the board came with some optional plugs for the screw holes. I'm really happy with the Lux, and I'm sure it would be a great option for any progressing freestyle rider with its fast planing, ease of ride and very good pop indeed. The unconventional design of the V shaped underside and moulded central fin work very well, and its nice to see a manufacturer breaking the mould and pushing board design in new directions.